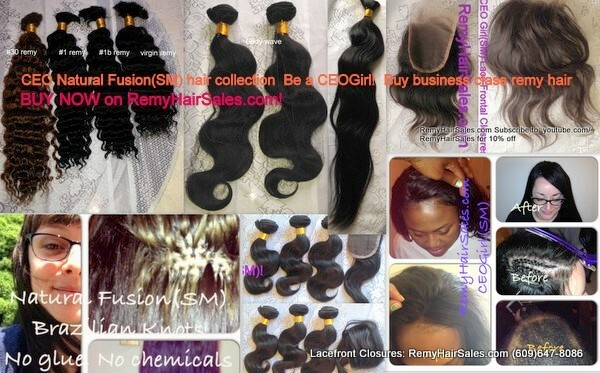 CEO Natural Fusion's hair collection reviews. Be a CEO Girl! Today. "Here is a picture you asked for of your hair installed. There will also be people calling to order hair because they really liked mine. I hope to send more customers your way." L., Michigan, USA." Virgin Brazilian curly 16", 18", 20". See Mixed Length Brazilian Remy 3 bundle deals, and virgin remy deals. "I just received my order and I am so in love with this hair Thank u Thank u I will be ordering again!" P., California USA. -Indian Remy Body wave 20", 22", 24"
See Mixed Length Indian Remy 3 bundle deals, and virgin remy deals. "Kaale was fantastic. She went above and beyond, even making sure I got the product on Saturday. The product is really nice, soft and does not tangle... K., Colorado USA." -Brazilian Remy curly 20",20", 18",20",22"
See Mixed Length Brazilian Remy 3 bundle deals, Same Length buy 1 get 1 free bundle deals, and virgin remy deals.